This guest blog post is provided by Ella Herz, who is Chief Operating Officer at Orbit Logic, a leader in mission planning and scheduling solutions for aerospace and geospatial intelligence. 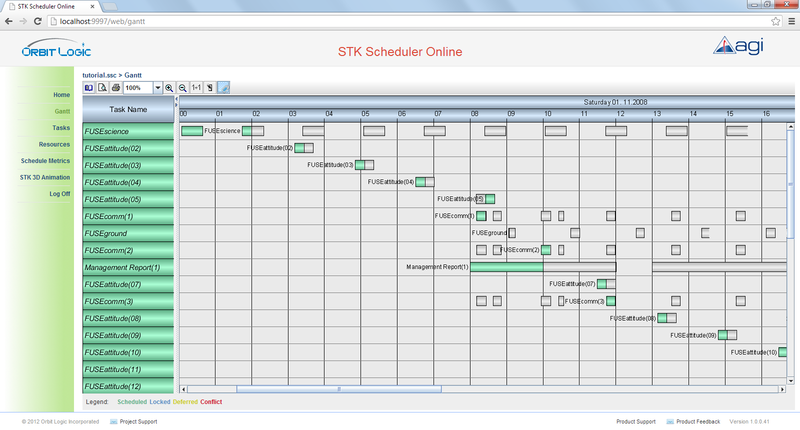 Orbit Logic recently announced the release of STK Scheduler Online Viewer using NETRONIC's VARCHART JGantt. STK Scheduler Online Viewer is a web application for the secure dissemination of schedules generated by STK Scheduler, an add-on module for Systems Tool Kit (STK) software developed by Analytical Graphics, Inc. (AGI). STK Scheduler Online Viewer users login through a web page to explore details of available schedules in table, Gantt or 3D animation views. A wiki-like interface allows the user to drill down for more detailed information on scheduled tasks and resources. STK Scheduler provides flexible resource modeling, configurable constraint implementation, and task definition for any type of space system scheduling challenge. Complex satellite system scheduling problems can be defined in minutes and solved in seconds using STK Scheduler. These schedules can now be shared via STK Scheduler Online Viewer. STK Scheduler Online administrators can define and maintain authorized user lists to control access to schedules. Administrators can also customize STK Scheduler Online pages with program-specific news, images, and announcements. Orbit Logic chose Netronics JGantt for STK Scheduler Online Viewer in large part due to Orbit Logic’s experience with Netronics Gantt tool for the STK Scheduler desktop application. Plus, NETRONIC's VARCHART JGantt was the only Java based tool with all the necessary features including zoom, multiple label locations, ability to edit directly from the Gantt, configurable colors, expand/collapse capability, precision to one second, and multiple nodes per row. The web version provides similar capability to the desktop version with a more modern look and feel. Orbit Logic (www.orbitlogic.com) is a leader in mission planning and scheduling solutions for aerospace and geospatial intelligence. Orbit Logic's operationally proven COTS products – STK Scheduler, Collection Planning & Analysis Workstation (CPAW), web-based Collection Feasibility Tool (CFT), UAV Planner, and Sibyl Satellite Tasking mobile app - create better plans faster with fewer resources and less risk for all mission phases. Orbit Logic software maintenance and engineering services are available to support, configure, customize, and integrate these tools to provide turn-key operational solutions for your mission. In 2012, Ms. Herz changed her role with Orbit Logic from Founder-Owner and member of the Board of Directors to full-time employee and Chief Operating Officer. Ms. Herz has a strong background in software product development in a variety of industries and platforms. Ms. Herz’ aerospace background includes application development for Space Shuttle Payload Operations at Johnson Space Center, systems engineering and test for L3 Storm Control Systems’ Command and Control Software, and ground system engineering and test for the Astrium-built Intelsat X. Ms. Herz has worked outside of aerospace as QA Manager for Rosetta Stone and QA Director at Blackboard covering web and mobile applications. Ms. Herz received a bachelor of science degree in Mechanical and Aerospace Engineering from Cornell University.